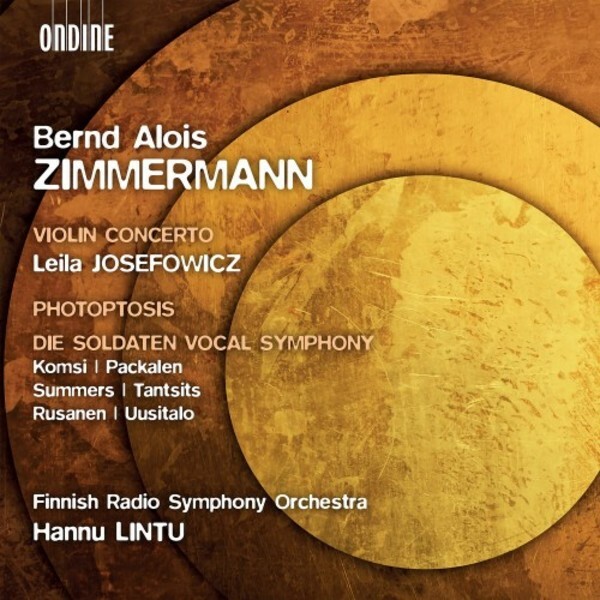 This new release by the award-winning Finnish Radio Symphony Orchestra conducted by Hannu Lintu is dedicated to the music of Bernd Alois Zimmermann (1918�1970), a leading figure in the music of post-Second World War Germany. This album includes a rendering of the composer�s magnificent Violin Concerto featuring star violinist Leila Josefowicz, orchestral score Photoptosis, as well as the first CD recording of Die Soldaten Vocal Symphony based on an opera that is widely considered as one of the greatest German operas of the 20th century. Zimmermann wrote his opera Die Soldaten, one of his keyworks, during the 1950s and 60s. The premiere of the opera was cancelled, and upon hearing the claim that the opera would be �impossible� to perform, the composer adapted parts of the opera into a 40-minute vocal symphony suitable for concert performance. This work, filled with power and drama, is much more than a description of the apocalypse of modern war, and deserves its rightful place alongside the operas of Alban Berg. Zimmerman�s Violin Concerto is a relatively early work in the composer�s oeuvre. It was premiered in 1950 but has suffered much neglect. The influence of Schoenberg, Hindemith, Bart�k, Stravinsky and Prokofiev are visible in this work which we might consider to manifest echoes of war. Photoptosis (1968), �Incidence of Light�, is among Zimmermann�s final orchestral pieces. Inspired by a painting created by Yves Klein for the Gelsenkirchen music theatre, this work includes quotations by Scriabin, Beethoven, Bach, and Wagner, among others. Yet, this �Pr�lude�, as described by the composer, is not a collage, but a study in orchestral sonority and light. Still little known outside its composer�s native Germany, the music of Bernd Alois Zimmermann (1918-1970) is long overdue wider exposure. And this fabulous new disc from Hannu Lintu and the Finnish Radio Symphony Orchestra on the Ondine label, recorded largely in Zimmermann�s centenary year, should help enormously. An older contemporary of Stockhausen and Boulez, Zimmermann wrote in a modernist style that avoided the set-in-stone orthodoxies of the Darmstadt School, and his ready embrace of an eclectic but discerning pluralism seems prophetic in many ways of our postmodern age. Raised in a devout Catholic household, his wartime service in the Wehrmacht scarred him for life, and in 1970 he took his own life, though not before leaving an impressive corpus of works, including his magnum opus, the opera Die Soldaten (�The Soldiers�, 1957-63), based on a 1776 play by Jakob Lenz, which pays homage in particular to Berg�s Wozzeck and remains one of the most important German operas of the 20th century. The present disc provides a tantalising overview of Zimmermann�s compositional periods through three of his largest-scale works. Earliest of the three is the Violin Concerto of 1950. It has been recorded before, notably by Thomas Zehetmaier on the ECM label, but this hugely committed and energised new performance from Canadian-American violinist Leila Josefowicz reveals it to be one of the great violin concertos of the last century. Josefowicz �discovered� the work during an intense listening session with her longtime friend and mentor, the late Oliver Knussen, and her palpable devotion to the music is evident throughout. This is music that packs a powerful punch well above its 18-minute timespan. Cast in the traditional three-movement form, it seems to unleash all the pent-up darkness and angst of the immediate postwar years in music that, while undeniably tough-edged, is far from inaccessible. Echoes of Schoenberg, Hindemith, Bart�k, Stravinsky and Berg abound, but there�s no mistaking the powerful individuality of Zimmermann�s own voice. The Concerto places formidable demands on the soloist, not least in the trill-laden second movement (�Fantasia�), including some magical textures for violin, celesta and pizzicato textures, but Josefowicz takes it all in her stride, while the full orchestra revels in moments of intense Bergian lyricism. Things really take wing in the rumba-rondo finale, with stylistic nods to Prokofiev and Stravinsky; Zimmermann�s writing for both soloist and orchestra is dazzling, and it builds to an overwhelming climax that leaves the listener wondering whether this is a celebration or an outburst of sheer terror. In Josefowicz�s own words, �The piece has an electricity to it, and a strength to it, and an emotional urgency to it that is rare.� Just as rare is to find a soloist who can convey these qualities with such obvious passion, and this performance, appropriately dedicated Olly Knussen�s memory, positively demands to be heard. The other major work here is the Vocal Symphony Die Soldaten, created from passages of Zimmermann�s opera at a time when a complete performance seemed unlikely. In the event, a performance of the symphony in its entirety had to wait until some years after the premiere of the opera itself. The symphony presents the opera�s Prelude and music from Acts 1 and 2 in a satisfying whole that highlights the use by Zimmermann of �absolute� musical forms (Ricercar, Nocturne, Capriccio, Chorale and Chaconne) in a manner similar to that of Berg. With a cast including soprano Anu Komsi (in the central role of Marie), contralto Hilary Summers and tenor Peter Tantsits, this performance amounts to much more than a mere �taster�, standing in relation to the opera much as the Drei Bruchst�cke to Wozzeck or the Lulu-Suite to Lulu: this is a viable and involving concert work in its own right, albeit one that calls for six accomplished vocal soloists and last over 40 minutes. Latest of the three works on the disc is Photoptosis (�Incidence of Light�, 1968), inspired by a painting by Yves Klein of the Musiktheater im Revier in Gelsenkirchen. It�s a striking example of Zimmermann�s pluralistic Klangkomposition style, scored for huge orchestra and incorporating among the seeming chaos recognisable fragments of Beethoven, Scriabin, Wagner and even Tchaikovsky�s Nutcracker. With a significant part for organ thrown in, this is an orchestral showpiece for our times for those ensembles willing to invest the time and musical commitment involved for a demanding 14-minute work. Lintu and his orchestra turn in a truly blazing performance, providing the icing on the cake for an utterly captivating disc, stunningly recorded. For those with open ears and any interest whatsoever in music of the 20th century, it�s an absolute must.